Singapore Airlines now lets you see 7 days of award availability for SQ/MI flights. It's promising, but not quite there yet. Award calendars are a useful feature that allow you to see a range of dates where award space is available. 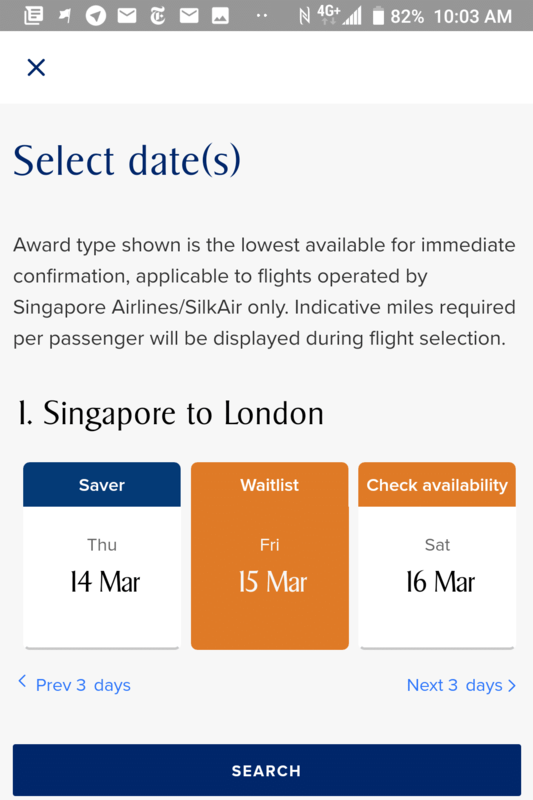 Historically, the Singapore Airlines website didn’t have an award calendar, which made made searching for award flights frustrating beyond words. Why? 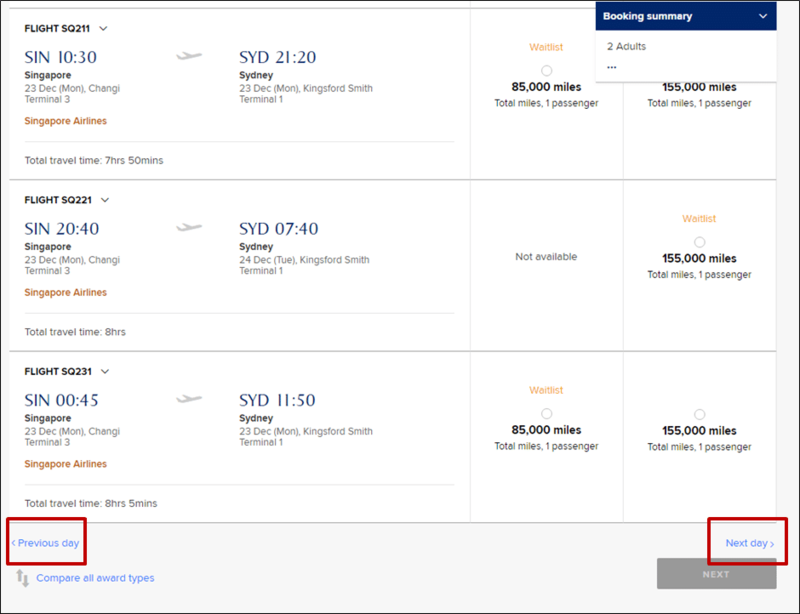 Imagine you’re looking for two First Class saver seats from SIN-SYD on in Dec 2019. This is a popular route and period, and it’s highly unlikely you’re going to find what you want on the first try. Assuming you don’t, you have to adopt a “guess and check” approach by clicking on the “Next Day” or “Previous Day” buttons, hoping each time that your next click will strike paydirt. It’s a very inefficient way of searching because you’re basically groping in the dark. Add in the fact that the KrisFlyer website is slow at the best of times, and you’re waiting roughly 30 seconds between seeing each search result. That may sound insignificant, but trust me, the time adds up. That’s why one bright spark in the recent KrisFlyer devaluation was the announcement that SQ was finally going to implement an award calendar on its website. Now, I was skeptical when I first heard this, because SQ’s not exactly known for its IT prowess. 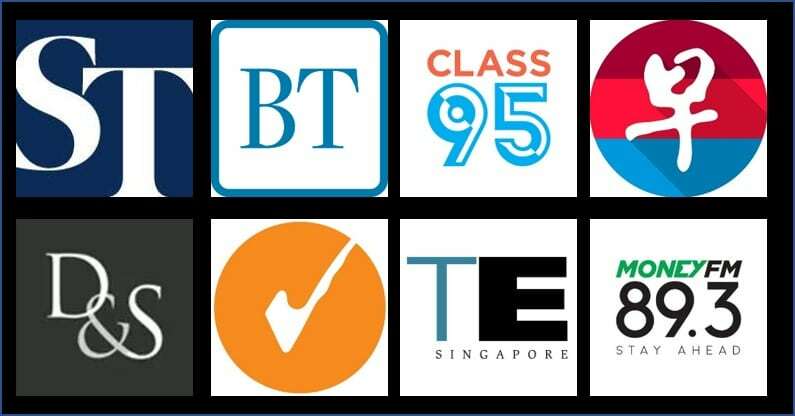 For example, back in November 2017 they pledged to make online partner award redemptions available in December 2017. They did, but the launch was a complete mess and only two partner airlines were available. In the months that followed, other airlines were added, but up till today you still can’t book domestic Japan/NZ flights or selected partner awards through the website. It seems that the award calendar feature has quietly gone live on the Singapore Airlines website. 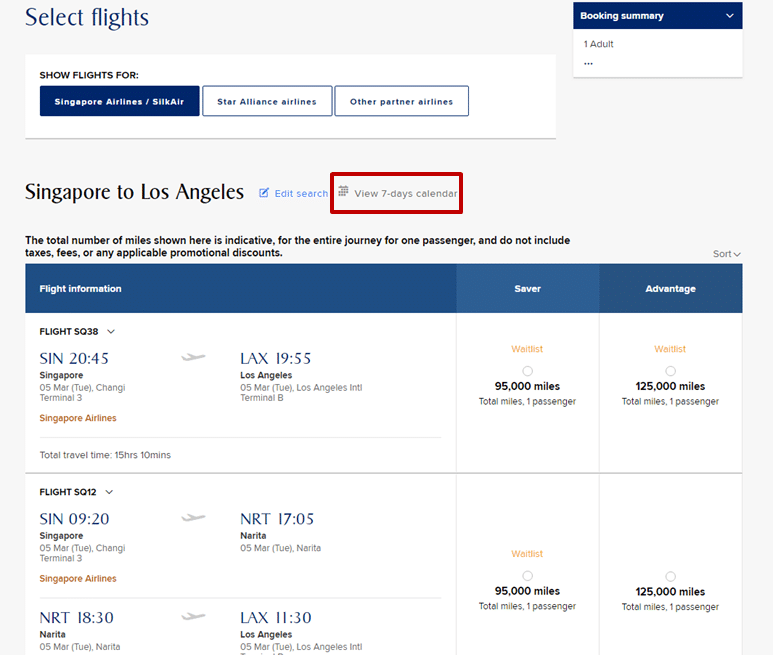 When you search for award flights, there’s an additional option to see a 7-day calendar of award space, as shown in the red box below. Clicking on that button sends you to a separate screen that shows, for the given number of seats you’ve requested, which dates have immediately confirmable Advantage/Saver space and which do not. The date you search becomes the mid-point of the range, so you’ll see space for +/- 3 days. Wait a sec, you say. What does the “check availability” tag for 02 Mar- 04 Mar mean? I thought the whole point of an award calendar is to show me an overview of award space, without requiring me to click into specific days? You’re right- it is a strange way to phase it. Based on my testing, “check availability” means that seats are either not available, period, or on waitlist only. In the particular case I’m showing above, clicking “check availability” changes to the label to show “waitlist” after a few seconds without taking you to a different screen. Given my past experiences with SQ IT, I have to say that I was pleasantly surprised at how fast the award calendar loaded. It’s not lightning fast the way some other sites are, but the average load time between each 7-day view was 5-6 seconds, which allowed me to quickly browse other dates. In these cases your only option is to restart your search from the home page. SQ’s mobile app has also been updated to provide award calendar functionality, but the downside is that you only see a 3-day window, i.e. +/- 1 day from your original search date. Needless to say, this makes searching award space a whole lot slower and negates the mobile app’s historical advantage over the website- faster loading times. The mobile app suffers from the same issue as the website, in that if there are no immediately confirmable Advantage/Saver awards in a particular 3-day block, trying to advance the calendar will result in an error. As of right now, you’ll only find the award calendar feature available when you try to book flights on SQ/MI. Given that SQ still hasn’t sorted out their issues with partner airline awards, it was probably a bit too hopeful to expect this. 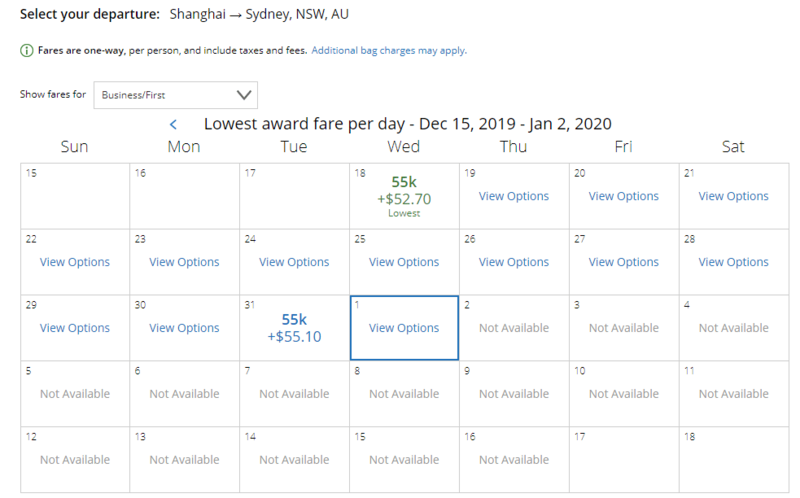 If you’re looking for a robust award calendar feature for Singapore Airlines flights, my recommendation would still be to check out a nifty free Chrome extension called award.flights. It has its limitations, but it allows you to see a much wider range of award space at one go (up to 30 days), and needs a lot less hand holding. You can set it up to run your search and come back 10 minutes later to view the results, depending on how complicated your request is. SQ’s addition of an award calendar is definitely a welcome feature, but there’s still work to be done to make it a truly useful addition to the site. My dream is that we’ll one day have a system that shows you exactly how many Advantage and Saver seats are available for immediate confirmation on each date, thereby providing you with a much easier way of scanning and narrowing down your flights. It’s not like this is “proprietary” information or anything like that- you could easily derive the number by methodologically adding one seat each time you search until the waitlist is triggered. Let’s hope the IT team continues to improve the award calendar, because a lot of people are going to find it useful. Hey Aaron! I’m trying to redeem a J saver ticket for Singapore to Newark for SQ in the later part of this year. However, from June onward, all the saver options are showed as “not available”. In your experience with SQ so far, have you ever seen these seats open up few months later?